A great Account Plan should make your entire team feel smart, confident, and empowered to make the customer more successful. Unfortunately, for many companies, Account Planning has become little more than a box-checking exercise. 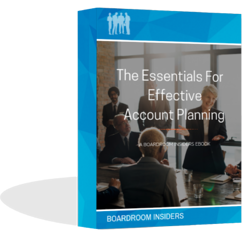 This educational ebook is designed to put you on the road to better Account Planning practices. Five Essential Things Your Account Plan is Probably Missing. A sample Boardroom Insiders "Account Anatomy" cheat sheet. Happy planning and happy selling!